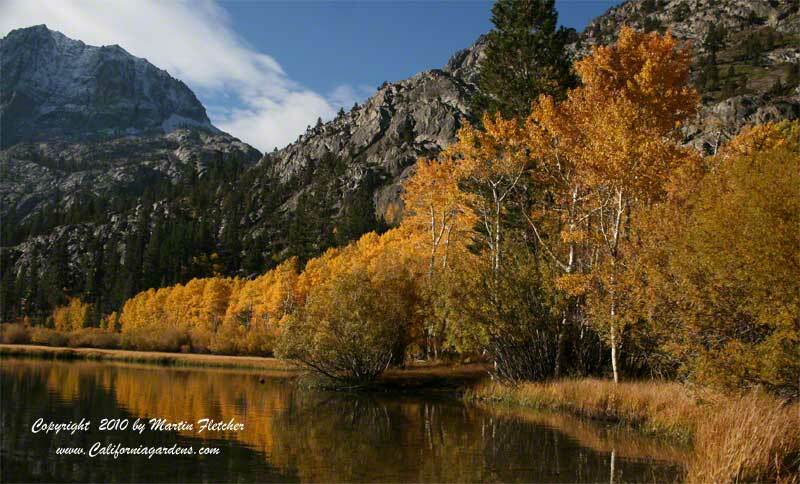 Fall Color in California, emphatically yes! There are plants that turn in the Fall. It has been a regular complaint that we do not actually have seasons here in California. While I agree that they are not as sharply demarcated at the coast as those of some other regions, we can still get a spectacular fall display if you look in the right places or plant the right plants. And we can enjoy it while we are wearing shorts and tee shirts flipping burgers on the BBQ. The Eastern Sierras can sate any need for color. One often thinks of trees when the subject of Fall Color is mentioned. We list our favorites below. There are a number of shrubs with great foliage and berries. And one should not forget that the rosehips can be spectacular if they are left on the bush. In addition to feeding the birds this helps the roses go dormant They do much better with their winter's rest. While we don't get much snow here (like none in my garden) picking up leaves can be made much easier by using a lightweight snow shovel. I use it as if it were a giant dust pan with a long handle. Then I sweep or rake the debris into the shovel for a quick cleanup. When there are massive amounts of leaves I use the snow shovel and a rake as large extensions of my arms and clamp the leaves while lifting them into the waste can. Many of the deciduous fruit trees have great color. My apples and apricots look great with a carpet of fallen yellow leaves.